A list of the top gift cards for women plus the reasons why these gift cards are perfect for wives, girlfriends, and all the ladies you love. 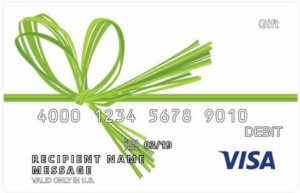 Shop eGift Cards from Visa® and Other Top Brands for fast and free delivery. Before I had kids, I shopped Ann Taylor, Banana Republic, and other stylish stores in the mall. Though I kept a modest budget and shied away from high-priced boutiques, I bought nice-enough clothes. Now, with three active kids, volunteer work, and a full-time job to keep me busy, I only have time to buy clothes in the same stores that carry the milk and bread on my grocery list. So at the risk of sounding selfish and ungrateful, I make a plea on behalf of busy women everywhere. Please get gift cards for women so we can make one trip to the store (or shop online) to get the things that best fit our needs and our style. Whether she chooses to buy her clothes at the mall, at a boutique, or in aisle seven of the warehouse store, universal gift cards issued by Visa or Mastercard can be used to make the purchase. Busy women can even use these bank-issued gift cards to get a haircut, visit the spa, pay a parking ticket, or enroll in culinary academy. Whether shopping online or in-store, this is a time-saving gift card that can be used in multiple ways. 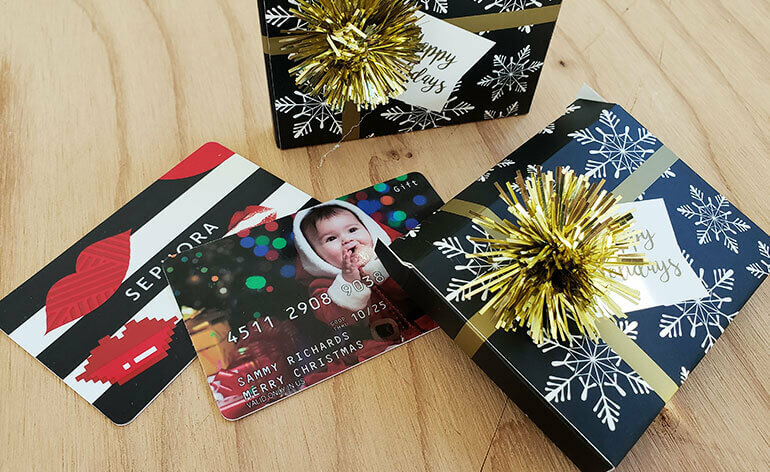 And don’t forget, you can add a personal touch to these cards by uploading a photo from your smarphone, desktop or social media account to make a personalized gift card. 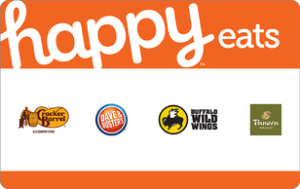 If you’re not sure which gift card to get the lady in your life but you want something more specific then a general use card, try the new Happy Lady gift card in the Happy Card family. 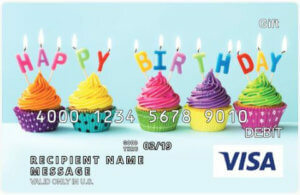 The Happy Lady gift card is usable in Sephora, Spafinder and other places ladies like to shop. You might also try the Happy Beauty Gift Card or the Happy Bride Gift Card if she’s soon to be married. Buy Happy Lady Gift Cards, Happy Beauty Gift Cards, and Happy Bride Gift Cards. 3. Department store gift cards. Women are not typically secretive about where they shop. If you compliment her blouse, she’ll tell you where she bought it. If you comment on her necklace, she’ll tell you where to buy the bracelet that goes with it. With just a little bit of effort, you can find out at which stores she regularly shops, and get gift cards accordingly. Macy’s, Nordstrom, JCPenney, Kohl’s and other department store gift cards are popular with women because the stores carry a wide selection of merchandise and styles, are often conveniently located, and they have robust online stores as well. Despite being pressed for time, many women still make detours to their favorite specialty stores like Victoria’s Secret, Lululemon Athletica, GAP and Anthropologie. A gift card to indulge her guilty pleasure will be a welcome treat. Last year, I told my daughter I’d love a gift card to Athleta so I could buy a good quality swimsuit–something I wouldn’t normally allow for in my budget. Buy GAP Options gift cards that are usable in Banana Republic, Athleta and more. Nothing blows off steam like a night out with the girls—laughing, commiserating, or celebrating. Whether it’s a pottery party at Color Me Mine, one of the new “painting and sipping” classes everyone is talking about, or a simple get-together at a local restaurant, women will appreciate a night out with friends and the gift card that makes it all possible. Try the new Paint Nite gift card, a Groupon gift card or one of the others in my list the best experience gift cards. Buy a Paint Nite gift card or Groupon gift card. Speaking of treats women do not often make time for… Some of the best gift cards are the ones that allow the recipient some choices in how they are redeemed. With the Spafinder gift card, the woman you treat this holiday season can use this gift card at a salon, spa or healthcare location at literally thousands of locations across the country. If you know for sure what salon or spa she loves most, then shop local and buy the gift card directly from that place of business. Here’s my only word of caution. Only get a beauty gift card if you know the woman in your life expresses an interest in cosmetics. This is not a time to send your lady a passive-aggressive message implying that she needs to doll herself up. If she does love make-up, then go for it. I would totally use a beauty gift card and my daughter would too. But some of my dearest and most beautiful friends prefer a clean face and I admire that. Gift cards to stores like T.J. Maxx, Marshall’s and Home Goods would actually top my list. I love finding trendy styles at prices I can afford. If the woman in your life also likes to comb through the racks in search of a deal, then check out these choices. Ah shoes! Can she ever have enough shoes? Get her a shoe store gift card and find out. I have a closet full of shoes myself, but still “need” a new pair of boots, some tennis shoes, a pair of slippers that I can wear in the morning and more. What about the lady on your list? With smartphones and other connected technology being common place in our homes and offices, electronics gizmos and gadgets are no longer under just the purview of men. Women need ear buds, speakers, new laptops, connected devices and more. With an Apple Store gift card, she can upgrade a device or buy a new accessory. With a Best Buy gift card, she can buy speakers, software, a new TV and more. If the lady in your life is digitally connected, then try one of these gift cards. What Other Gift Cards do Women Want? Did I get this list right? Leave a comment below if I didn’t. And just consider this advice. When it comes to getting gifts for women, the gesture of taking time to pick out a traditional present will not go unnoticed. But the likelihood that you’ll get it right—the right clothes, the right style, the right accessories, and the right size—is slim. So rather than waste your time searching for presents that will probably get returned or worn with regret (curse the boat neck blouse! 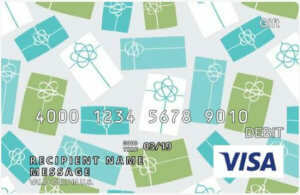 ), get gift cards for women instead. It’s the best gift for busy women this holiday season.